On Monday, January 21, we celebrate the life and legacy of Dr. Martin Luther King, Jr. Today more than ever his message resonantes: embracing the differences of others, peacefully bringing positive change to our country and building a “Beloved Community” by serving each other and lifting up those in need. 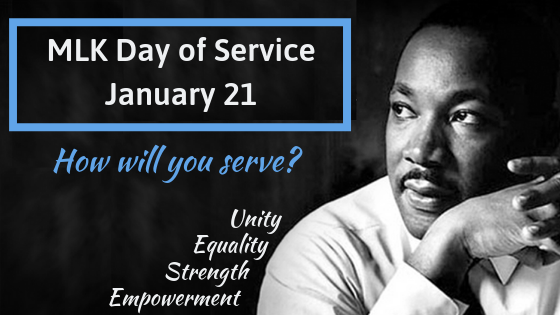 The MLK Day holiday is more than a day to commemorate the work of a visionary man, it is also designated as a National Day of Service. We are all officially called into action; to make it a “Day On not a Day Off.” This weekend take some time to plan how you will help build a stronger local community on MLK Day and throughout the year. A great place to start is with the searchable database of volunteer opportunities offered by nationalservice.gov. It may be difficult prioritizing volunteering in our busy and challenging lives, but once you take the step you’ll find your time spent in service of others will never feel like a burden. Thanks to technology, there are ways you can take part in service on MLK Day right from your own home. One very simple way is to run a YouGiveGoods event raising brand-new goods for your neighbors in need. Support any cause when you raise most-needed goods like healthy food, books, toys, hygiene items, coats, diapers and more all delivered by YouGiveGoods to your favorite local charity. Friends and family will love the ease and transparency of shopping online. Another way to support a cause without leaving your home is as a virtual volunteer. Simply contact your favorite charity and ask about virtual volunteering opportunities. Use your skills to help a charity when you offer your services in areas such as marketing, accounting, event planning, and web design. YouGiveGoods celebrates the efforts of all those who will take part in the 2019 MLK Day of Service. We can’t wait to hear about all the good deeds done in the name of the great man we honor on January 21.